​This two day clinic explains how to achieve an independent seat and how to move in harmony with your horse. This information applies to all riding disciplines. Our clinician is Tom Nagel. Tom's background is in martial arts, Zen Bodywork and general horsemanship. His Rider's Seat clinics are extremely popular because they are very effective in helping riders gain better body awareness and a deep, independent seat through proper breathing, body awareness and alignment. Tom has taught this material throughout Europe and the U.S. and we are very excited to bring him to Southeast Michigan! The Rider's Seat Clinic is intimate and each participant receives individualized attention from the clinician. For this reason, each group is limited to 12. We have arranged two identical clinics in order to accommodate up to 18 riders and 6 non-riders. The two clinics are identical and each runs two full days. Morning sessions consist of lecture, demonstrations and unmounted exercises on the ground. Information about using the psoas (core) muscles for stability and releasing the hyoid muscles to achieve lift in the saddle is presented. Afternoon sessions consist of small group riding sessions applying the techniques and methods learned in the mornings. Tom does some rider alignment bodywork with the participants during the course of the clinic and each participant receives a complimentary copy of Zen & Horseback Riding. Non-Rider - Participates in all morning work, and AUDITS all afternoon sessions. Auditor - This is a non-participatory viewing of the morning's work and the small group sessions in the afternoon. There may be an opportunity for Q&A in the afternoon prior to the mounted sessions. 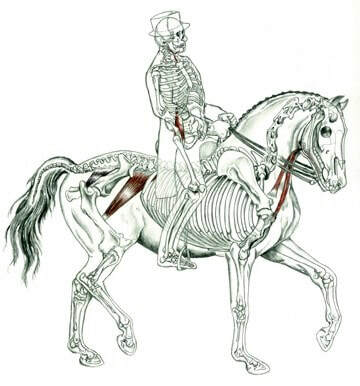 ​Illustration of the psoas (So-Az) muscles of the human and the horse. Also shown are the Hyoid muscles of the human and horse. 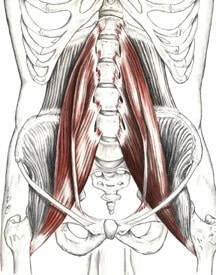 The Hyoid muscles relate to the ability to breathe deeply and have direct relationship with the psoas muscles.